Here are some Cactus Figs, Indian Figs, Tunas or as we know them in Spanish, Higos Chumbos. 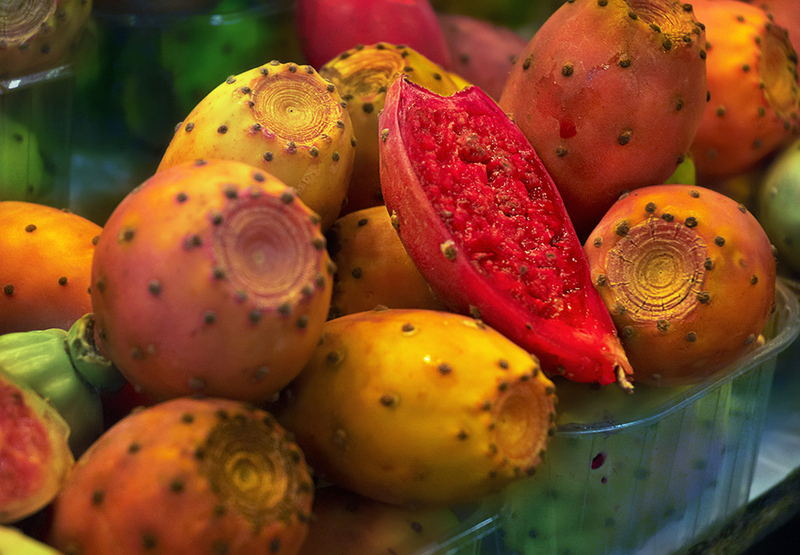 A lot of names to designate a delicious fruit that oddly enough comes out of Opuntia ficus-indica, a cactus. This is one good example of specialization, of survival in extreme conditions, one of those wonders of mother nature. Would you expect to get food out a cactus!? I mean, imagine you are a primitive man, you are starving and you get lost in the Sonoran desert. You know that you should not try any odd beautiful fruit or plant cause previous experience tells you that it could be dangerous. You probably get to smell it, lick it but finally the spines make you change your mind. I have always wondered who was the first to try so and so, say, eating an octopus or a snail or a swallow's nest or a shark's fin!? They say cattle have a knack for this plant once farmers burn it to get rid of the sharp points. I suppose no one got rid of the spines for us in the past, or was it a lightning perhaps, maybe a suicidal cow who dared to chew on it or why not, the blasting jet of a mysterious alien mothership? I have read that in Mexico you do not only eat the fruit but also the young pads called nopales before they grow the spines of course and have them with eggs and jalapeños for example. In southern Spain higos chumbos grow in the wild as they have this incredible ability to multiply out of any small fragment but there are also extensive crops. Take for example the case of Murcia where almost 200 tons of tunas are harvested every year. The plant has some medicinal properties too as it contains a mucilaginous substance good to treat nausea, headaches, fever, arthritis, constipation, asthma, burns, stomach-ache and a long etc, it even served as a remedy to fight scurvy during long sea journeys. Besides, there are lots of recipes for both sweet and savory dishes. I just wanted to show you how they looked at La Boqueria market and to let you know that it is quite common to find them when you travel around Spain. Care for a bite? The colors are so rich in this. This is not only eye-catching but mouth-watering photography. Nicely done! Great colours and love the compostion. The colors are great, it's really nice to look at. And interesting info too. Fabulous colors on these photos. Beautiful!